The Kenyan president’s official chair had a temporary new occupant last week – and Kenyans aren’t happy. The offending rear belongs to gospel star Bahati, whose unprecedented breach of protocol won’t be repeated any time soon. By NJERI KIMANI. It was business as usual for Kenyan gospel superstar Bahati as he performed in front of a large audience at the launch of the Jubilee Party at a Nairobi stadium. The crowd was on its feet as he launched into Mama, his best-known hit, and even President Uhuru Kenyatta – seated in the front row seat of honour – looked as though he was enjoying himself. A true showman, Bahati decided to get the president more involved. He shimmied over and coaxed the smiling Kenyatta from his seat. Emboldened, Bahati thought he’d go back for the president’s wife, first lady Margaret Kenyatta. The song is about Kenyan mothers, after all, so it was only fitting to include her. She took a little more convincing than her husband, so Bahati sat in the empty chair next to her to try to talk her into getting on her feet. Except that it wasn’t an empty chair, exactly. It was the president’s chair, an ornate wooden and red leather number with the presidential seal branded into the back rest. In Kenya, this is an extraordinary breach of protocol. 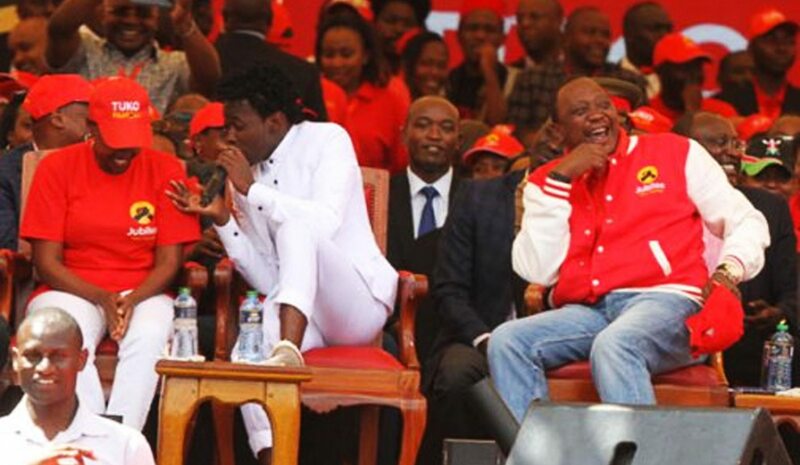 No one sits in the president’s chair except the president himself, and Bahati’s transgression did not go unnoticed by Kenyatta, who stood awkwardly on the stage as the musician sang from his throne. At one point, Bahati even had his feet up on the stool reserved for the president’s refreshments. Afterwards, Bahati joked about the incident, describing himself as Kenya’s “shortest-serving president” on social media. But not everyone thought it was funny. On both social and traditional media, Bahati came in for plenty of criticism. “Society operates on strict social rules, some of which are unwritten. Sociologists talk of social distance defining relationships. There are invisible lines that must never be crossed. That line was crossed at Saturday’s launch of the Jubilee Party,” said an editorial the Standard, which went on to describe Bahati as “highly disrespectful”. “No one is even allowed to be near the dais without the security personnel knowledge. The president’s actions are well choreographed. [Security] know when he will sit and when he will stand and how he will move. They must have been gotten completely unaware,” said Samson Cherambos, who was head of security for former president Daniel Arap Moi. Cherambos said the security breach exposed Kenyatta to an increased risk of attack. The intense backlash eventually forced a sheepish Bahati to apologise on national TV. Bahati said he had completely forgotten protocol as he got caught up in the moment. He was relieved, however, that State House seems to have brushed off the incident. “I was in constant fear that I would be jailed any time. I was just waiting for the security officers to come and arrest me for breach of protocol. I knew I would be jailed any time and I’m grateful it hasn’t happened,” he said. Joseph Omondi, Nakuru Centre of Accountability Forum Chair, said Kenyans should follow the lead of the president and relax a little. “Our president is a cool guy and doesn’t take some of these things seriously. However, some people still harbour the school of thought from traditionalists who take the issue of presidency seriously. They feel that everything around him should be given some modicum of respect. This includes the seat and even the water he takes,” said Omondi. If anything, Omondi argues, the incident was good for the president’s image, showing him as a “friendly man” who can adapt with grace to any situation.